My girls are busy (boys are lazy - no surprise…LOL)! We are now in nectar flow season, when the bees are loving bringing home the nectar from local flowers and trees such as the Linden and Black Locust. So how did we get here? Well, about a month ago, my husband (maker of best self-leveling hive stand ever and dispeller of lazy boy myth begun above) and I went into to do our Spring cleaning of our single over-wintered hive, with the intent of dividing the hive (called creating splits) and creating our own queens with the OTS (“on the spot’ created by Mel Disselkoen) method. I love this method of developing a sustainable and chemical-free apiary. Essentially, you take a more active role and help your bees rear their own queen and break the Varroa Mite cycle (so do not have to use harsh chemicals). We took out each frame, cleaned off the propolis and burr comb (goop on the edges so lots of scraping) and looked for the queen. 40 frames (frames hand vertically, 8 per box / super) and a bee-stung foot right later (note to self to ALWAYS wear my rain boots with my bee suit and not to not shake out a box of bees on my foot - I am not one of those cool / foolish beekeepers that goes in unprotected), still did not find the illusive queen. 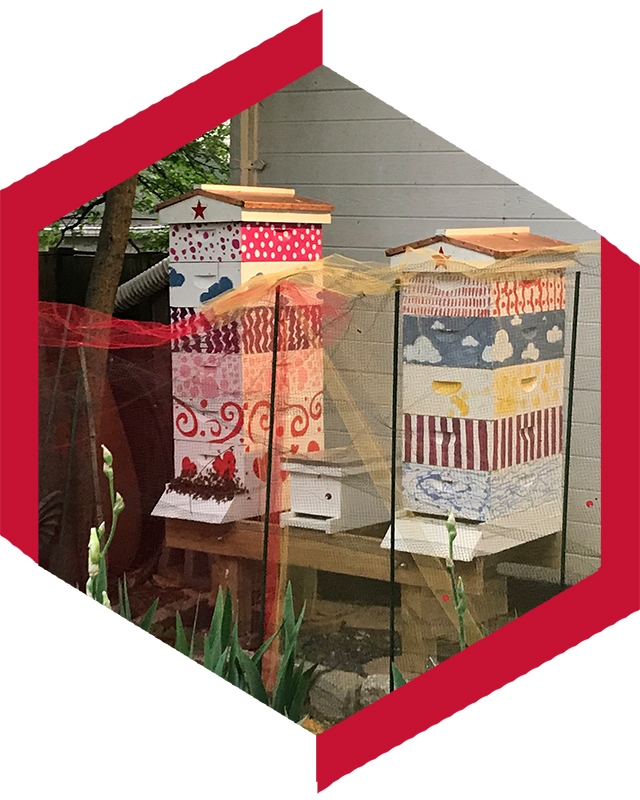 We divided the hive in two, notching 1-3 day old larvae on selected frames to encourage worker bees to create their own queen in the 2 newly-divided hives. A queen is created by continuing to feed royal jelly to the larvae beyond the worker bee level (worker bees are fed royal jelly, worker jelly, and bee bread -- mix of regurtated bee phlegm from plant materials — delicious) that seems to help develop her bigger / longer body and protects her ovaries so that she can lay eggs. Amazingly, the major factor in the type of bee is simply what the larvae eat and is “chosen” by the hive. A week later, we went back into the 2 hives. In the first one, queen cells had been made and were empty. This was great news and explains why those bees were a bit hot and grumpy! In the second hive, we found the old queen right away (had doubts about queen finding skills after previous week). So, we took the over-wintered queen and placed her in a small 5-frame box (called a Nuc, or nucleus hive) with a couple brood ( bee babies) frames and renotched frames in this second hive to help their new queen production along. By pulling the old queen, we created an artificial swarm. A swarm is the sign of a healthy hive that has survived the winter and is ready to divide and go out into the world. Unfortunately in our urban environment, only a small number of those swarms can survive unassisted. This negatively impacts honey collection since essentially half the workforce is on “strike!" We look forward to checking back in on the buzzing ladies to see how all is going. Hoping to put a honey super on the small Nuc and be certain the other hives have enough room for their honey stores.